Cochise makes her journey to the launch facility this weekend. Depending on weather, sometime next week it begins. There is no firm schedule. We will try for daily, albeit very short, updates once the fun starts. We guarantee it is not going to be dull. This entry was posted on Thursday, June 2nd, 2016 at 6:37 am and is filed under Dashew Logs, FPB 78, The Logs, three. Both comments and pings are currently closed. You accomplished your goal of adding a different look with the new bow decor. Very nice touch, you’ll likely see it on boats that follow, at least on one more……enjoy every day. I’ll be the first to ask – what’s the plate on the transom under the CO / GEO ? A soft patch for one day removing some piece of equipment in the stern workshop? Early on there was a dorade box with a grill detailed into the corner of the lockers. This was later eliminated, but the plate had already been cut out. So, we had the choice of welding in a section with the weld lines showing, putting in a faux grill, or making a cover for access to the corner which was otherwise difficult to get into. Well done, bring it on! Would be interesting to be there for the ride. 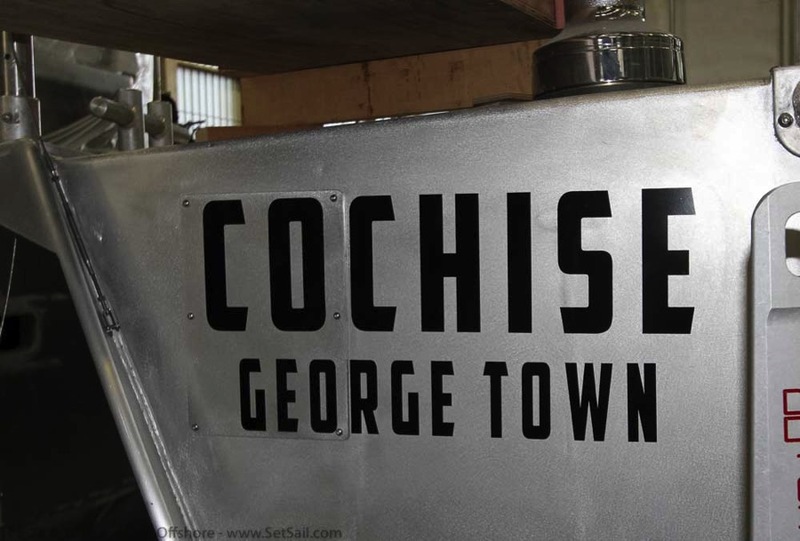 What is behind that panel that has the “CO” in Cochise? Can’t wait to see her in the water. The upper corner of the locker, (see more detailed answer earlier). How did y’all come to pick the name “Cochise” …? The two of us had not discussed it and independently came up with this as a possibility while driving through the the area he lived on the way back from the holidays. You can look him up on the Internet for details. Cochise, a Chiricahua Apache chief, is a historical figure we have always admired, and somehow the name feels right for FPB 781.